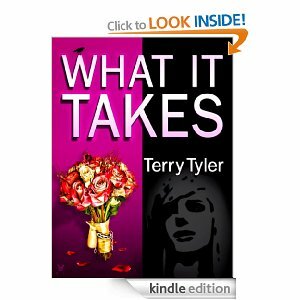 I have just (literally) finished reading “What it takes” by Terry Tyler. I was captivated from the start and can honestly say that it is the best thing I have read in contemporary fiction for a very long time. I love the idea these days that people can self-publish. Lots of people feel they have at least one book in them and if you have the tenacity, the determination, and the sheer dogged patience to write a work of novel length, then good luck to you I say. Unfortunately though many writers, while having very good, even brilliant, ideas are not, in practice, skilled wordsmiths. Paying a proofreader or an editor can be expensive so, often this stage is missed. Shame. The result is that there is a lot of very badly written work out there these days. Not so Terry Tyler’s work. Her use of language and metaphor is a delight – it floats off the page and is a joy to read. In order to lose myself in a book I like to read at conversation speed, hearing the voices of the protagonists as I do. It brings a book alive. And this book has a lot of life to bring. All the characters are solid, real, with utterly believable strengths and flaws. The story tells the tale of the members of a family (3 sisters and their mother) and their respective partners and children. What is really fascinating about it is that each character in turn tells a bit of the story from their own point of view and then other members of the family tell it from their perspective. This must be hugely difficult to write, or at least difficult to write well. But Terry Tyler handles it immaculately. How on earth she manages to describe each character so expertly from so many different angles is a mystery but I am in awe of her ability to do so. The novel is a genuine page-turner. In fact it had me hooked so badly that it almost became grounds for divorce! This is the first Terry Tyler novel I have read and, as it happens, it is her latest. But I am now going back to devour everything else she has written before. Five stars for this one and highly recommended.